A Lithuanian man has been arrested on suspicion of being an unlicensed gangmaster in Wisbech. 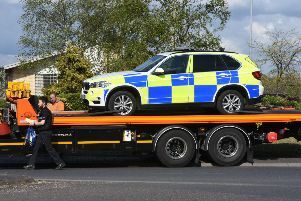 The 30-year-old man was arrested this morning (Tuesday) following an operation involving the Gangmasters and Labour Abuse Authority (GLAA), Cambridgeshire police Fenland District Council, the Department for Work and Pensions, the British Red Cross and the Salvation Army. Warrants were carried out at several addresses in Wisbech. GLAA officers arrested the man under Section 12 of the Gangmasters (Licensing) Act 2004. He is currently being held at a police station while the investigation continues. A total of 13 Lithuanian individuals have been taken to a nearby reception and are assisting the GLAA with its enquries. The Red Cross team is on hand to offer them any practical help or emotional support they might need.